Notice any changes to the blog? I have been working with the wonderful Maren at Maren’s Blog Designs on developing a brand new header for Beautifully Nutty. I can’t say enough great things about Maren. I am one of the most indecisive people on this planet, but she worked with me to help dig and find what I truly wanted and what was appealing to my eye. She was incredibly patient. I HIGHLY recommend her work. Besides the new banner, I have also switched from a blog hosted by WordPress.com to a self-hosted site through WordPress.org. I had been pre-warned that this process can be quite grueling, and the warning was found to be true. This has been quite the process. I am just beginning to learn all of the ins-and-outs of being self-hosted, but I promise you all, it will be worth it. When making this switch, I lost all of my followers. This includes all of my friends that had signed up to receive emails when a new post is up. Could you all do me a favor? Could you re-subscribe to my emails? I don’t want to lose you! Just go into the right side bar and re-enter your email and it should set up just like that. I’m so sorry about that. Like I said, I am learning a whole lot about this self-hosting bit. If there are details about my blog that you miss from the old site or that are driving you nuts about the new site, please let me know. There will be a lot of changes being made still. Thank you for your patience! I have a treat to share with you all. 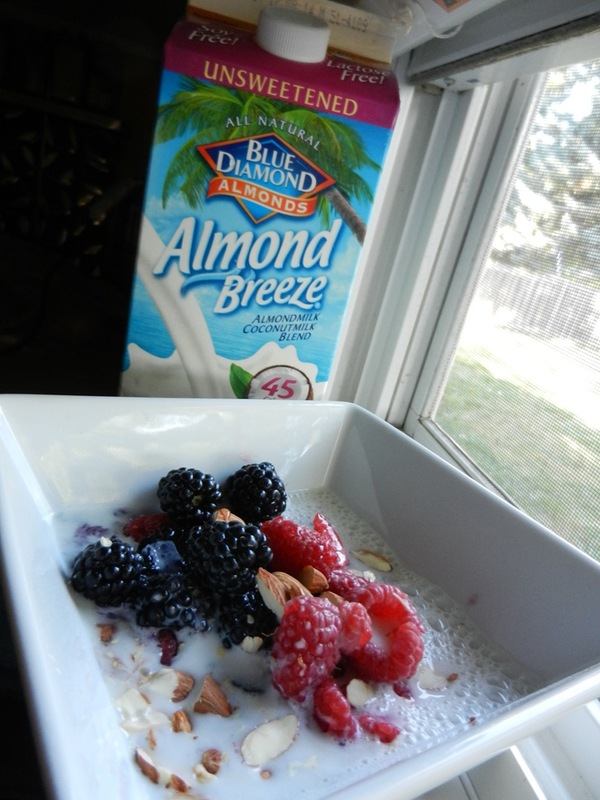 While at the Healthy Living Summit, I received some wonderful coupons for Blue Diamond’s Almond Breeze product. I have bought their products in the past and love them, and was super stoked to be able to go try out some new stuff using their coupons. I was at the store and stumbled upon this gem of an almond milk: Almond Milk and Coconut Blend. I HAD to try it! 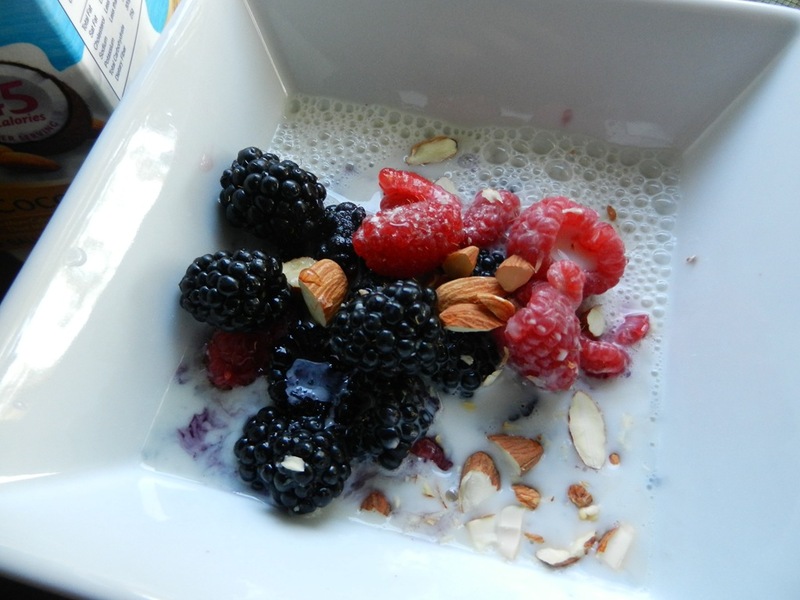 I poured the unsweetened milk over fresh raspberries, blackberries, blueberries, and chopped almonds. I then drizzled a bit of honey over this masterpiece. Oh my goodness, my belly was so happy. It doesn’t taste super coconutty which is good for me, but it does have a subtle coconut flavor. If you see this at your local grocery store, I suggest you give it a try. After breakfast I took Moose out for a 3 mile walk through the neighborhood. Then I got to hang out with my beautiful cousin Betsy for a few hours. Lunch was light. I ate a banana with peanut butter and an apple. Then I headed to the gym to crank out 20 minutes on the elliptical followed by push-ups and core work. The rest of the day was pretty much spent working on the ol’ blog. There were some errands sprinkled in the mix as well as some relaxation with the hubby. Dinner was so simple but it tasted extra good to me for some reason. 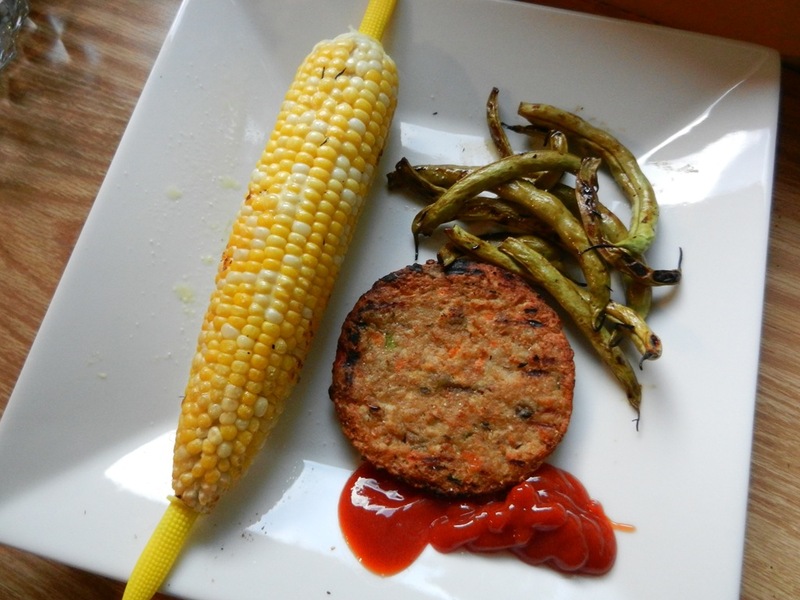 We grilled up corn on the cob, garden green beans with teriyaki sauce, and a Morningstar Garden Veggie Burger. Alright, I am off for the day. Enjoy your Tuesday friends. Muah! This entry was posted in Blog, Breakfast, Dinners, Fav Products, Workouts and tagged Almond Breeze, Blog Design, Morningstar by Melanie. Bookmark the permalink. I LOVE LOVE LOVE how your new blog looks with the header. It’s so perfect and I totally agree that the black is the way to go. I thought you might want the color numbers for the colors I used in your banner… that way everything like links and your background color can match perfectly. Thanks to all of your help! Thank you times a million for everything! Thanks Shannon! I am loving it too BUT still need to learn this CSS business. That’s way over my technologically challenged brain. I will learn though at some point. So glad you like the milk! Mmmm I should try some in my coffee. Sounds deliciouso. Love the look! I am actually working with Maren too on a face lift for TTT 🙂 Can’t wait! Hope all is well!